Author Steve Parker and Editor in Chief Robert Winston explain all the amazing things the human body can do. 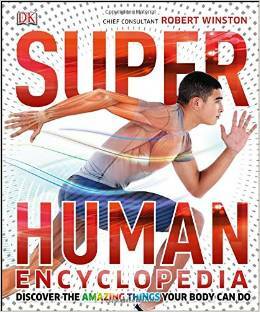 From the human brain to muscles and bones, SuperHuman Encyclopedia explains to kids the extraordinary processes behind the ordinary human body. Packed with interesting facts about the human body, from how we keep cool and how memories are made to how the human body fights infection and how many muscles we use to smile, SuperHuman explores and explains how the body works.